Marc was the first voice of Western Reserve Radio when it was known as Amateur Sports Radio Online. He has since hosted many events on Western Reserve Radio. His career spans nearly 25 years in various capacities but most notably he is the voice of high school football and the host of Youngstown Sports Live on WBBW Sports Radio 1240-Youngstown from 3:00PM-6:00PM Monday through Friday. You may also recognize him as the voice of Grove City College Wolverine Football. You can hear Marc this spring as he leads the broadcast for the Cleveland Cobras Football Team. Dave Ferris works behind the scenes in technology and programming. He brings years of terrestrial radio experience to Western Reserve Radio after having worked at local stations including Sports Radio 1240-Youngstown and Fox Sports 1570 (now ESPN 1570-Mahoning Valley). Dave also owned and operated his own digital broadcasting company, "City View" which specialized in covering local sports. Tim Continenza is a sports personality who has been a part of the Mahoning Valley sports scene for last 25 years. Tim is currently in his second year as the voice of New Castle Red Hurricanes basketball on WKST News Radio 1200 and the Triblive High School Sports Network. This past high school football season, Tim broadcast 20 games on ESPN 1570. Tim has hosted sports talk in the Mahoning Valley most notably was “Valley Sportsline”. Tim has also announced college sports in Western Pennsylvania for Allegheny News Talk Sports Network for Allegheny College and this past season announcing football games for Carnegie Mellon University. In 2017, Tim, along with Anthony Kepley, formed Radio MVP which can be found at radiomvp.com. Matt Emch is not new to the broadcast profession and certainly no stranger to valley sports. He is a graduate of Ursuline High School where he received multiple sports awards and was inducted into the Ursuline High School Hall of Fame. Matt was also a member of multiple Youngstown State Penguin national championship football teams lead by then coach Jim tressel. In the past, Matt has hosted his own radio show, "Just Football with Matt Emch," on Sports Radio 1240-Youngstown and ESPN 157-Mahoning Valley. Matt has worked with Tim Continenza as the color analyst for high school football on Z-104FM and ESPN 1570-Mahoning Valley. Matt will team with Tim Continenza as the inagural high school football broadcast team for Western Reserve Radio. 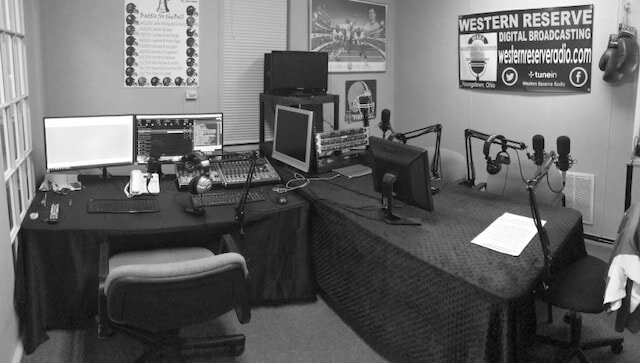 Western Reserve Digital Broadcasting, also known as Western Reserve Radio (WKKX-DB), is independently owned and focuses on live sporting events as well as sports talk and news. Our goal is to bring listeners new and exciting programming in 2019.